A competition sealed Enclosure for your extended cab Chevy/GMC early years pickup where application and art converge. Built with a plexiglass viewing window, with V-Block sound deadener and special interior bracing that makes sure of no air leaks or vibrations. Silver screw down binding post terminal block. 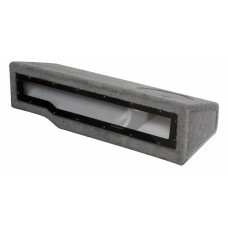 .88 cu ft of Air Space for higher power woofers. Single Woofer 10" or 12".